Arms: Checky, argent and gules, on a chevron of the last, three etoiles. The Athy family of Galway were an Anglo-Norman family, credited with being the first to erect a stone building in Galway city, in the 13th century. They went on to become one of the fourteen Tribes of Galway, and erected several castles and great houses over the centuries. Those include that at Rinville. The family survived in Galway up the the middle of the 20th century. The first of the line was Gerard de Athee, who was born in France at Athee Sur Cher. Gerard became a very well known Knight and military leader for Richard the Lionhearted, King of England. He was the Castilion of Chinone castle in France for King Richard. He and his son Engelard of Cigogne are mentioned in the Magna Carta, which was signed by King John in 1215. Engleard of Cigogne adopted Athee as his surname. In the early 1300's his descendants migrated to Ireland and Athee became Athy. No records exist for Galway prior to the date of the Anglo-Norman invasion; among the earliest preserved the name Athy appears as a leading family in that city. 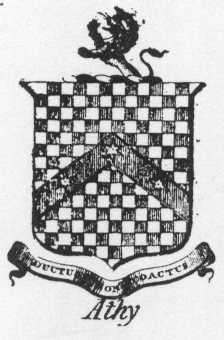 Nevertheless the first time the name Athy comes into prominence in the history of the city is (c. 1320) as a party to a series of deadly disputes between the Blakes and the Athys in which the Athys were worsted. The Athy's were never comparable in influence with the more powerful of the Tribes, but several of them held important posts in the area, e.g., William de Athy, Treasurer of Connacht 1388. The surname Athy, now scarce, is a type which is common in most countries but very rare in Ireland, being formed from a place name. The Athys were of Norman stock, settled at Athy, County Kildare (the Red Book of Ormond records two tenants named de Athy in County Kildare in 1311) whence they soon migrated to County Galway.